Following the pathway of an ideal Smart City as to aesthetics, Noida has initiated setting up vertical gardens. This move will also help to curb pollution which has occupied most part of the city. What makes the vertical garden unique is the fact it grows vertically. The technique, using a trellis or other support system is employed for this type of garden. This world renowned technique has found a place in Indian cities like Delhi, Bengaluru, Ahmedabad, and Kochi. “In Noida, one can find them on elevated roads, pillars under the metro rail corridors, drains and flyovers and among other locations in the city.” Noida Authority officials said. 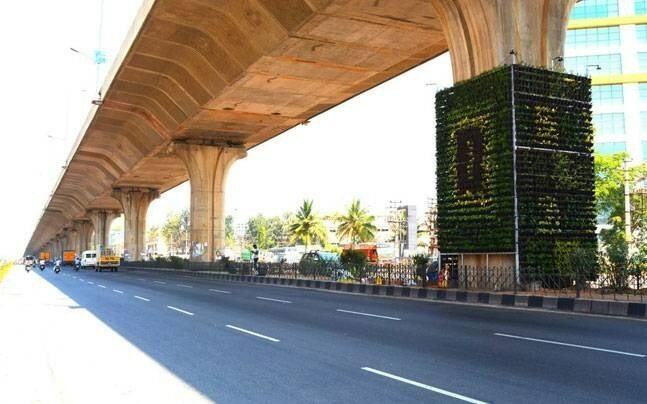 The authority has already moved a step ahead by setting up the vertical garden at its office in Sector 6, besides one under the Sector 15 flyover which is the access point of a city when approaching from Delhi by road. “With six metro pillars in Sector 15, our target is set to work on them by August 15. Also, the tender for the requisite has been floated,” said Noida Authority General Manager Rajeev Tyagi. Some plant species covered in this vertical garden are money plant (golden), ficus long island, ophiopogon japonicus, syngonium butterfly, tradescantia, chlorophytum comosum, and ophiopogon jaburan.